Italy’s Equo S.r.l. 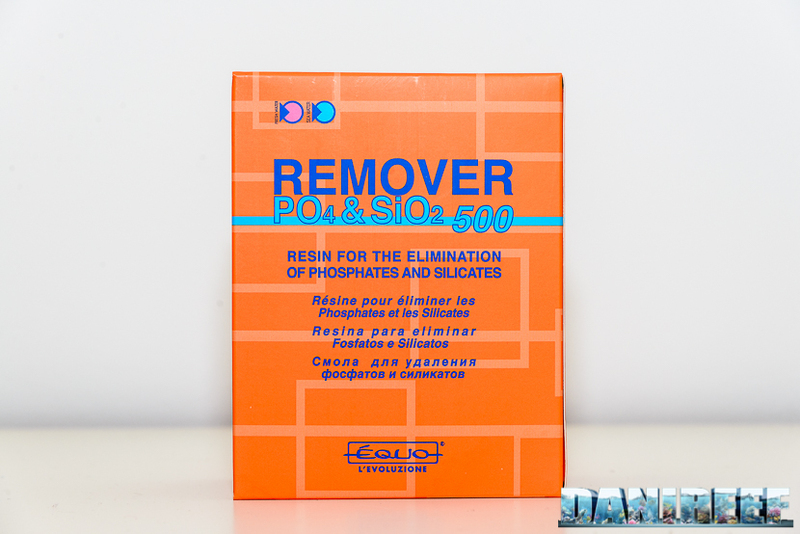 has just released a new filter material, the Remover Po4 & SiO2. 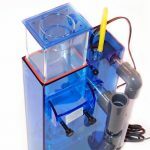 The product is designed to solve the phosphate and silicate troubles that many marine and freshwater aquarium owners face, and is listed by the company under “filter materials and removers” to which carbon, zeolite, and anti-nitrates material also belong. As you know, the removal of excess organic and inorganic compounds is part of regular reef tank maintenance, as they could interfere with the vital parameters of the live stock. The most monitored ones are definitely nitrates, phosphates and silicates. Nitrates can be kept to a minimum through optimal bacterial filtration, but Po4 and SiO2 are a more challenging, sometimes driving us to using removal substances. Silicates are often present in the RO water we use, and even the best-performing membrane cannot remove them completely. 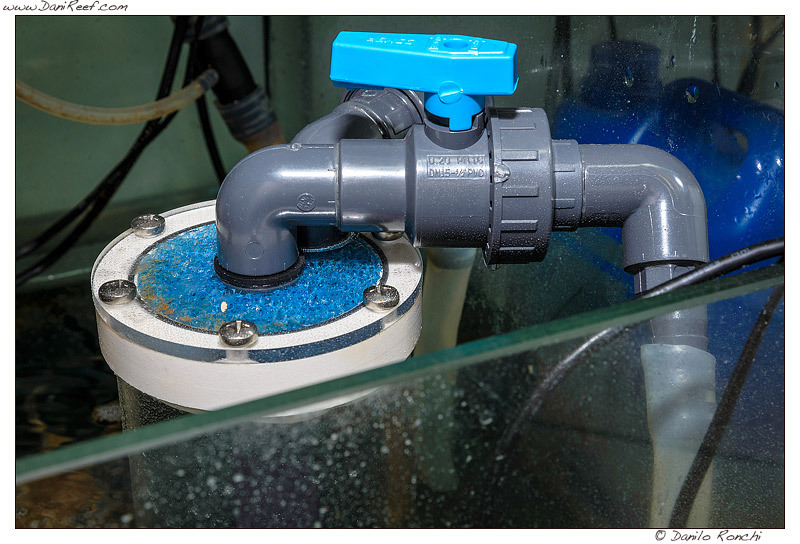 Phosphate buildup is a common tank problem, often due to organic material decay from over-feeding our fishes and inverts, or the poor quality of the RO water used. 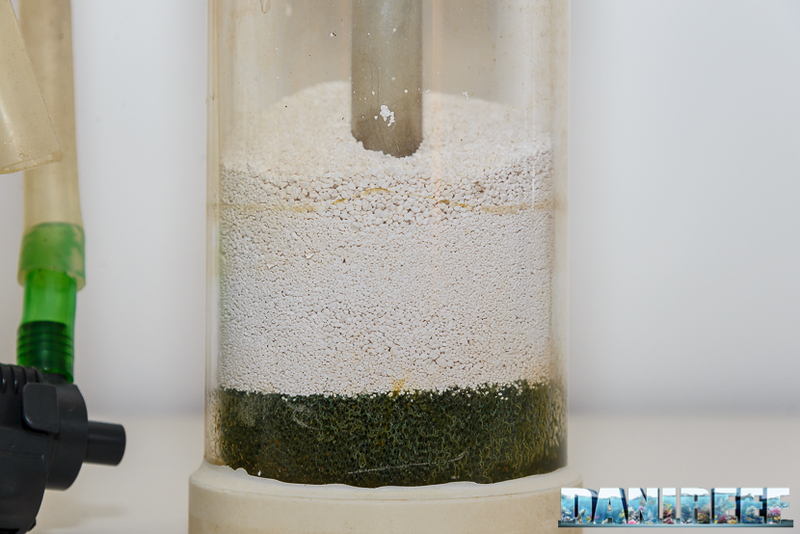 A phosphate problem is easy to recognize…uncontrolled algae growth, cyanobacteria, darkening of coral tissue, slowed calcification process of corals, and even death. 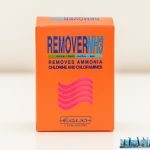 The material used in this remover is aluminum oxide – Al2O3, a compound with many advantages over Iron(III)hydroxide, which is most commonly used in commercial resins. Aluminum oxide has a high absorbency value just like Iron(III)hydroxide, but it has a much higher velocity of action. The compound is very stable and is insoluble in water; it doesn’t release aluminum or any other potentially harmful compounds. It’s also biocompatible (used in food preparation). The usual brown-reddish residue that most iron-based products leave in the tank are totally absent. Even though we know this residue is not harmful to our animals, we tend to worry when we see the water turn brown (even if for a few minutes), and I much prefer its absence. We are now ready to share our interesting findings with you. The package is excellent; a paper box the classic Equo orange and blue colors which distinguish the company at an international level. We had a 500g sample pack; there are also 100g, 250g, 1 kg, and 5 kg sizes available. As always, the bigger the package, the better the deal. 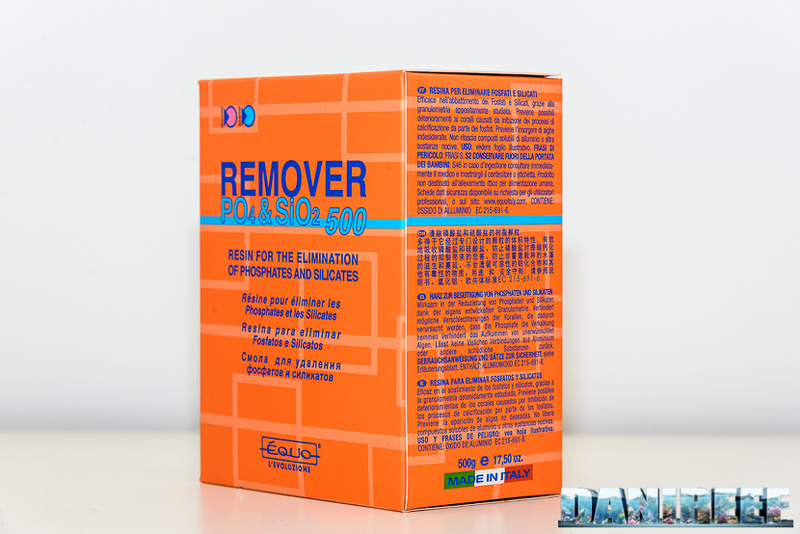 The box includes a mesh for containing the material, detailed instructions in several languages, and the resin, well-sealed in a laminated aluminum bag which guarantees optimal product conservation. Inside the bag is the salt-like material, made up of unsymmetrical white, round grains. 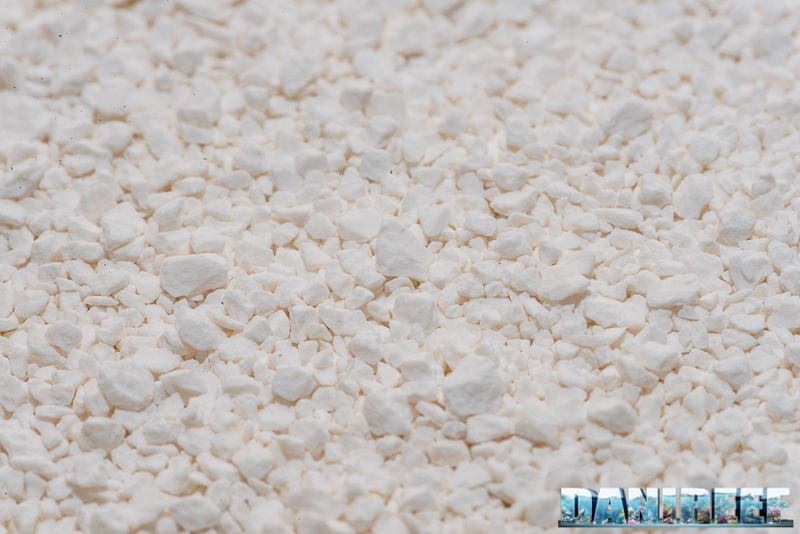 The grain size is designed specifically for use in the sump, and it differs from the other product Remover Po4 & SiO2 Reaktor, which is finer and made for fluidized bed filters. 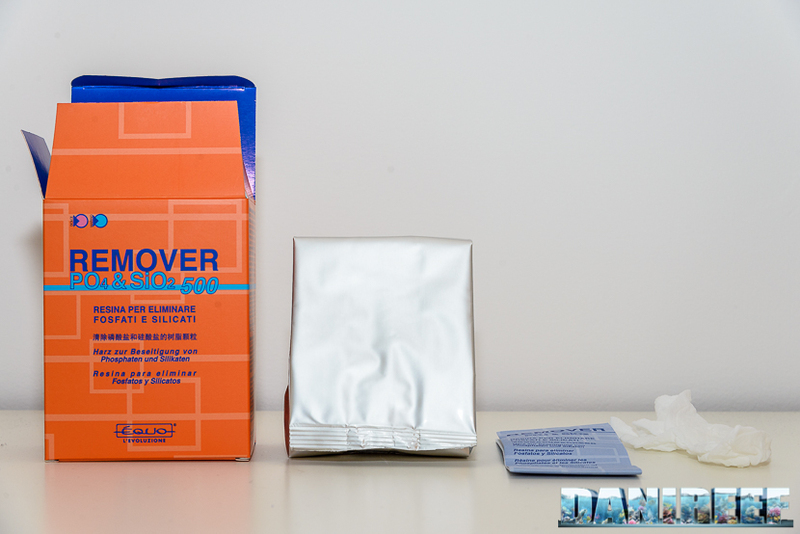 We tested Remover Po4 & SiO2 in a small/medium size tank (approximately 230 liters) with a starting phosphate value of 0.5 mg/l (measured with brand-new Salifert tests); this resembles the situation described in the product instruction. Unfortunately, we couldn’t test its effectiveness in the removal of silicates, as the tank was already at a 0 value. 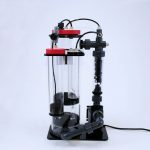 We based our test on the instructions given by the manufacturer: 100 grams of product for the treatment of 100-200 liters for a freshwater or marine tank with a starting value of 1 mg/l PO4. Based on their estimates, this quantity of product should bring the phosphate value down to the desired value of 0.01-0.02 ppm after just one week. Once the phosphate value is down to the minimum level we should replace the media with fresh ones, to allow it to remove silicates, the latter, in fact, only starts to be removed when the phosphate level is close to zero. After this initial procedure, the media should be replaced periodically to maintain the values. We put the media in its bag, closed it, and rinsed it in osmosis water to remove any possible residual dust, but there was none…a real surprise compared to the dust produced by the iron hydroxide!Note: Aluminum oxide causes a chemical reaction when it comes in contact with water which releases heat. It is not dangerous but important to keep in mind, and it is well-explained in the instructions. Equo has thoughtfully made the data sheets for all its products available on its website. The sheets contain summarized information about the product, health & safety information, first aid instructions, anti-fire precautions, and how to dispose of any leftovers. 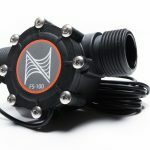 It meets the national and European regulations on chemicals, which, in my opinion, is proof of the product’s reliability and of the company’s high production standards. We then waited seven days as instructed, all the while practicing our usual maintenance and feeding routine for the fish and corals. Before removing the bag of media, we took a new measurement. Unfortunately, the phosphate value wasn’t much lower from the one measured seven days earlier, leaving us puzzled about the efficiency of the product. 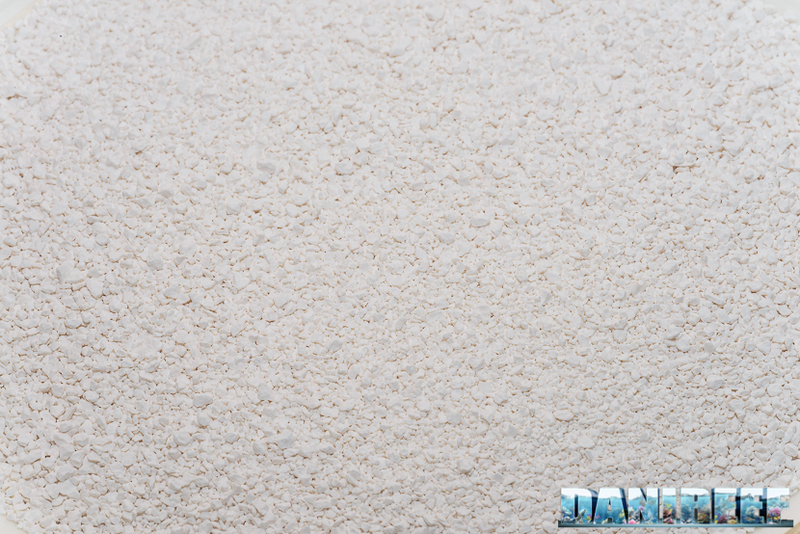 We decided to try the resin in a fluidized bed filter, increasing the amount to maximize its efficiency. We started with a critical phosphate level – higher than 0.5 mg/l. After a week, the test results were finally in line with our expectations, near 0. The animals didn’t show any stress behaviors while this product was in the system; on the contrary, they really benefited from the phosphate reduction (after a couple of days my Catalaphyllia seemed to explode and after two weeks, all the SPS corals started growing again and showed more intense coloration). I have tried many iron hydroxide-based resins in the past, but I have rarely achieved such impressive results in such a short time. Still, optimal performance only occurred when we used the media in a fluidized bed filter, even though they are not specifically meant for this use. Moreover, the dosage given in the instruction leaflet is probably good for a freshwater aquarium, but was too low for marine tanks. For this reason, we advise that you buy the bigger packages and dose the product accordingly. € 158,6 for 5 kg, that is 31,7 € al kg. As expected, bigger packages are much more cost-efficient.